9-9-99 was an auspicious date. Cacia found 18 hand pieced Dresden plates in an antique store. They spoke to her. She bought them, and a book on quilting, and made her first quilt. 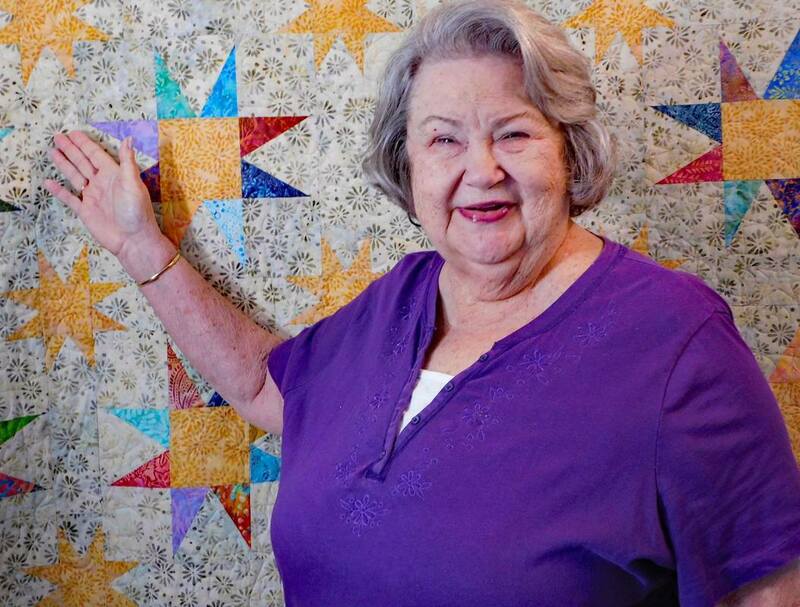 In 2000 she bought a summer home in Franklin, NC, joined a quilt guild and her quilting education took off. In 2006, she began working with Deb Heatherly at her quilt shop, Deb’s Cats N Quilts, in Franklin. When Deb invented 3 quilting rulers, Cacia hit the road demonstrating them at various shops and quilt shows. In 2015 Creative Grids bought the rights to these rulers. Cacia began accompanying Deb as they traveled the country, including several International Quilt Markets in Houston, to demo the tools and teach Deb’s techniques. Cacia has served as a pattern tester for Deb and has personally pieced quilts that have been published in all 5 of Deb’s books. She travels with an extensive trunk show of quilts, all from Deb’s books and patterns. She conducts classes and workshops teaching the use of Deb’s Cat’s Cradle, Strippy Star, Turbo 4 Patch and Flying Geese rulers. In recognition of her knowledge, she has been asked to judge several quilt shows. Cacia was born in Huntington, West Virginia. She graduated from high school in Chillicothe Ohio before moving on to attend Wesleyan College and ultimately receive a degree in government and public administration from American University. For most of her working years, she was a Human Resources Officer for the State of Florida Department of Health and Rehabilitative Services. Cacia and her husband, Rick, have been married for 35 years. No children, pets or even houseplants, but plenty of beautiful quilts. Cacia winters in Fort Myers, FL where she teaches at Quilt Lovers Hangout, and returns for summers in Franklin, NC.